Celebrate their birthday in a fun and flavorful way with our exclusive birthday cake design tower. 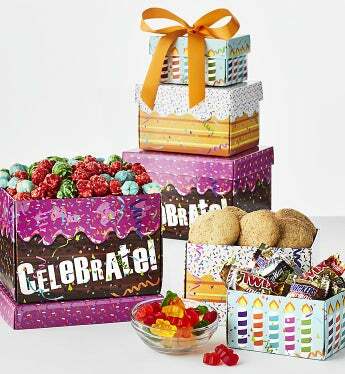 It's packed with perennial favorites including Mars® Mini Snickers®, 3 Musketeers®, Milky Way®, and Twix® Chocolate Bars, Cheryl's Snickerdoodle Cookies, colorful Gummy Bears, and festive The Popcorn Fruitfetti® Popcorn. Make their day!